A short skit by students to create awareness about social contribution. 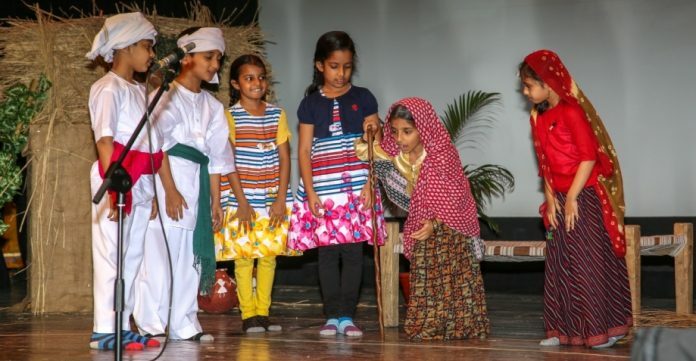 A spirit of patriotism pervaded proceedings at Rawdat al-Quran al-Kareem’s Annual Day programme held in the Sophia College for Women’s auditorium. In the distinguished presence of honorable guests and parents, the students from all of the school’s seven classes presented segments centred around the theme of love for one’s country. The well rehearsed, elaborately prepared segments were interspersed with some light comedy and cheeky magic tricks. The end of the programme saw a presentation by the entire school in verse form, about the founding philosophy of the school as an institution rooted in a Quranic approach to education, and the different stages of learning through which the students progress. This Annual Day programme was especially significant as it celebrated the school’s very first hafiz (one who has committed the entire Quran to memory) Shabbir bin Huzaifa, since the beginning of the school seven years ago. A highlight reel of a recent ten day adventure to Kashmir was shown to the audience before they departed the auditorium with smiles on their faces and a reinvigorated sense of patriotism in their hearts, as notes of the band that had performed the national anthem still lingered in the air.